Our persecuted brothers and sisters in Iraq need our prayers. 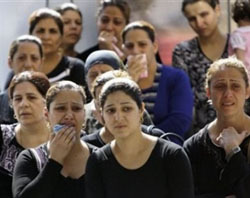 Mosul, Iraq, Nov 17, 2010 / 02:50 pm (CNA).- The situation for Christians in Iraq is becoming bleaker. The violence directed against them is no longer limited to the capital city Baghdad, but has been spreading throughout the country. Two Christian men were killed Nov. 15 in the northern city of Mosul, about 250 miles northwest of Baghdad. The men were shot as they sat in the living room of their home. The latest wave of violence began Oct. 31 when Muslim extremists massacred more than 50 worshipers in Baghdad’s Syriac Catholic Cathedral of Our Lady of Salvation. Bombings of Christian homes around the city quickly followed as part of what some Church officials and other analysts describe as a concerted effort to erase the ancient Christian footprint from the nation. Father Firas Benoka, a Syrian priest in Mosul, said Nov. 16 that at least five Christians have been killed in Mosul and Baghdad in recent days. Some were murdered in their homes while others were victims of car bombs. A report from Italy’s Catholic Avvenire newspaper placed the death toll of Iraqi Christians in recent days at seven. “There is a climate of terror that fills the Christian homes not only in Mosul and Baghdad, but also those on the plain of Nineveh,” Fr. Benoka told CNA of the mood in the country. The plain of Nineveh, where Mosul is located, is one of the ancient cradles of Catholicism. The towns and villages that dot the plain are home to some of the world’s original Christian communities, dating back nearly 2,000 years to the dawn of Christianity. Read more here. This entry was posted in Anti Christian, Body of Christ. Bookmark the permalink.